Human papillomavirus (HPV) vaccines are now included in immunisation programmes in 71 countries. Unfortunately, uptake has been impacted in some countries by reduced confidence in the safety of the HPV vaccine. In 2013, we published an extensive review demonstrating a reassuring safety profile for bivalent (2vHPV) and quadrivalent (4vHPV) vaccines. A nonavalent (9vHPV) vaccine is now available and HPV immunisation programmes have been extended to males in 11 countries. The aim of this updated narrative review was to examine the evidence on HPV vaccine safety, focusing on the 9vHPV vaccine, special populations and adverse events of special interest (AESI). The previous searches were replicated to identify studies to August 2016, including additional search terms for AESI. We identified 109 studies, including 15 population-based studies in over 2.5 million vaccinated individuals across six countries. All vaccines demonstrated an acceptable safety profile; injection-site reactions were slightly more common for 9vHPV vaccine than for 4vHPV vaccine. There was no consistent evidence of an increased risk of any AESI, including demyelinating syndromes or neurological conditions such as complex regional pain or postural orthostatic tachycardia syndromes. The risk–benefit profile for HPV vaccines remains highly favourable. The online version of this article ( https://doi.org/10.1007/s40264-017-0625-z) contains supplementary material, which is available to authorized users. A comment to this article is available online at https://doi.org/10.1007/s40264-018-0657-z. A comment to this article is available online at https://doi.org/10.1007/s40264-018-0656-0. Catherine King, National Centre for Immunisation Research and Surveillance, assisted with the literature review. Anastasia Phillips was an employee of the National Centre for Immunisation Research and Surveillance at the time of writing this paper. Kristine Macartney, Anastasia Phillips, Alexis Pillsbury and Cyra Patel have no conflicts of interest that are directly relevant to the content of this study. Julie Brotherton is employed as the Director of the National HPV Vaccination Program Register, which is owned and funded by the Australian Government Department of Health. She has been an investigator on investigator initiated HPV epidemiology studies which have received unrestricted partial funding for laboratory components from Seqirus (cervical cancer typing study) and Merck (recurrent respiratory papillomatosis study) but has never received any personal financial benefits. European Medicines Agency. Assessment report: review under Article 20 of Regulation (EC) no 726/2004, human papillomavirus (HPV) vaccines. London: European Medicines Agency; 2015. http://www.ema.europa.eu/docs/en_GB/document_library/Referrals_document/HPV_vaccines_20/Opinion_provided_by_Committee_for_Medicinal_Products_for_Human_Use/WC500197129.pdf. Accessed Nov 2017. World Health Organization. Causality assessment of an adverse event following immunisation (AEFI): user manual for the revised WHO classification. Geneva: WHO; 2013. http://www.who.int/vaccine_safety/publications/gvs_aefi/en/. Accessed Nov 2017. IOM (Institute of Medicine). Adverse effects of vaccines: evidence and causality. Washington, DC: The National Academies Press; 2012. https://doi.org/10.17226/13164. NCIRS. Evaluation of the National Human Papillomavirus Vaccination Program. Canberra: Department of Health; 2014. http://www.immunise.health.gov.au/internet/immunise/publishing.nsf/Content/evaluation-of-NHPVP. Accessed Nov 2017. Subelj M, Ucakar V, Kraigher A, Klavs I. Adverse events following school-based vaccination of girls with quadrivalent human papillomavirus vaccine in Slovenia, 2009 to 2013. Euro Surveill. 2016; 21(14). https://doi.org/10.2807/1560-7917.ES.2016.21.14.30187. MHRA. Cervarix HPV vaccine: update on UK safety experience at end of 4 years use in the HPV routine immunisation programme. London: Medicines and Healthcare Regulatory Products Agency; 2012. http://www.mhra.gov.uk/safety-public-assessment-reports/CON221607.Accessed Nov 2017. Therapeutic Goods Administration. Enhanced school-based surveillance of acute adverse events following immunisation with human papillomavirus vaccine in males and females, 2013: Therapeutic Goods Administration, Department of Health; 2015. https://www.tga.gov.au/enhanced-school-based-surveillance-acute-adverse-events-following-immunisation-human-papillomavirus-vaccine-males-and-females-2013. Accessed Nov 2017. Centers for Disease Control. Contraindications and precautions: general best practice guidelines for immunization: Best Practices Guidance of the Advisory Committee on Immunization Practices (ACIP). 2017.https://www.cdc.gov/vaccines/hcp/acip-recs/general-recs/contraindications.html. Accessed 4 Nov 2017. Agence Nationale de Securite du Medicament (ANSM). Human papillomavirus vaccination and risk of auto-immune diseases: pharmaco-epidemiological study in France. France: ANSM; 2015. http://ansm.sante.fr/. Accessed Nov 2017. World Health Organization. Global Advisory Committee on Vaccine Safety statement on safety of HPV vaccines: 17 December 2015. Geneva: World Health Organization; 2015. http://www.who.int/vaccine_safety/committee/GACVS_HPV_statement_17Dec2015.pdf?ua=1http://www.who.int/vaccine_safety/committee/topics/hpv/en/. Accessed Nov 2017. Brotherton J. 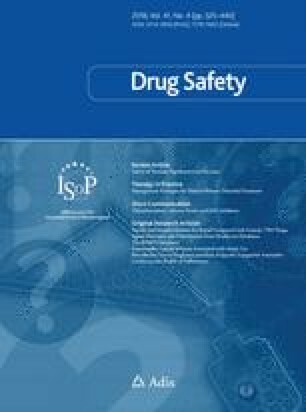 Safety of the quadrivalent human papillomavirus vaccine. BMJ. 2013;347:f5631. https://doi.org/10.1136/bmj.f5631. Medicines Adverse Reactions Committee. Gardasil and autoimmune diseases. Wellington: New Zealand Medicines and Medical Devices Safety Authority; 10 Sep 2015. http://www.medsafe.govt.nz/committees/marc/Reports.asp. Accessed Nov 2017. Little DT, Ward HR. Premature ovarian failure 3 years after menarche in a 16-year-old girl following human papillomavirus vaccination. BMJ Case Rep. 2012;2012. https://doi.org/10.1136/bcr-2012-006879. (pii: bcr2012006879). Clinical Immunization Safety Assessment (CISA) Network. Review of a published report of cerebral vasculitis after vaccination with the human papillomavirus (HPV) vaccine. Atlanta: CDC; 2012. https://www.cdc.gov/vaccinesafety/ensuringsafety/monitoring/cisa/technicalreports.html. Accessed Nov 2017. World Health Organization. Global Advisory Committee on Vaccine Safety: statement on the continued safety of HPV vaccination. Geneva; 2014. http://www.who.int/vaccine_safety/committee/topics/hpv/en/. Accessed Nov 2017. European Centre for Disease Prevention and Control (ECDC). Technical guidance on the introduction of HPV vaccines in European Union countries - an update. Stockholm; 2012. https://ecdc.europa.eu/en/publications-data/technical-guidance-introduction-hpv-vaccines-european-union-countries-update. Accessed Nov 2017. World Health Organization. Statements by WHO Global Advisory Committee on Vaccine Safety on the safety of human papillomavirus (HPV) vaccines 2013–2016. Geneva: World Health Organization; 2016. http://www.who.int/immunization/sage/meetings/2016/october/GACVS_Statement_on_the_safety_of_HPV.pdf. Accessed Nov 2017. Yih K, Maro J, Nguyen M, Baker M, Balsbaugh C, Cole D, et al. Pilot of self-controlled tree temporal scan analysis for Gardasil vaccine. The Sentinel System; 2016. https://www.sentinelinitiative.org/sites/default/files/Methods/Mini-Sentinel_PRISM_Pilot-Self-Controlled-Tree-Temporal-Scan-Analysis-Gardasil-Vaccine-Report.pdf. Accessed 8 Nov 2017. Centers for Disease Control and Prevention (CDC), the food and drug administration (FDA), agencies of the U.S. Department of Health and Human Services. Vaccine Adverse Events Reporting System. 2012. http://vaers.hhs.gov/index. Accessed 1 May 2017. National Health and Medical Research Council. NHMRC additional levels of evidence and grades for recommendations for developers of guidelines. Canberra: Australian Government; 2009. https://www.nhmrc.gov.au/guidelines-publications/information-guideline-developers/resources-guideline-developers. Accessed Nov 2017.